Teachers, students and practicing therapists are finding Mastering Muscles & Movement – A Brain-Friendly System for Learning Musculoskeletal Anatomy and Basic Kinesiology to be a valuable resource. Here is what some of them have to say. "Mastering Muscles & Movement makes human anatomy and kinesiology highly accessible to the reader. The information is presented in a format that accelerates the learning process and creates a long-term functional memory for the student. 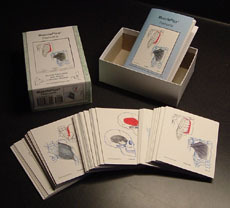 Accompanied with the study cards, Mastering Muscles & Movement makes learning fun and simple. I highly recommend this book for undergraduate to post-graduate students as well as practitioners in the field of healing arts and musculoskeletal medicine." 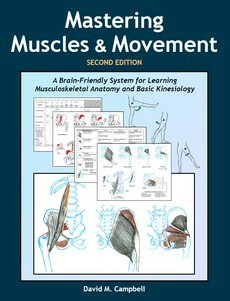 "Mastering Muscles & Movement presents an innovative and practical learning tool for students of Anatomy and Kinesiology. It is the first book that I have seen that actually demonstrates the steps to successful memorization and information retention. It gives you the sense that you are looking through the notes of the best student in class and learning their secret code. The simple, quick access to detailed content and the excellent selection of study tools will make this a book that students reach for first." "A new client, 80 year old male, is coming for care. He walks regularly and now has right hip pain and a right drop-foot while walking. I gathered five kinesiology books and Mastering Muscles & Movement (first time use of Dave’s book). Within a 20 minute scan of all 6 books it was obvious that MMM provided easy access to all the muscle details I needed with a very useful organization and a clear simplicity that offered a comprehensive download in a short time. This book would be a practical treasure in any body work practice." "It motivates you to pay attention, clearly modeling not only how to study this subject, but why it is important and how it is interconnected. The details of the pictures and organized details of the charts enhance the learning process completely and will allow for easier referencing upon completion of training."